Some industries such as mining, oil refinery, forestry, mobile welding, septic removal and refueling require some vehicles to have an emergency engine shutdown in place. The most effective method for this is to cut the air supply to the Diesel engine ensuring fuel ignition to cease. 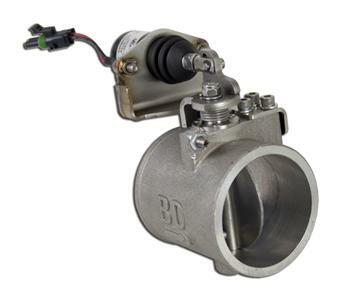 With BD’s Emergency Engine Shutdown, an inline butterfly valve is placed in the air intake line and when activated by its heavy duty electrical solenoid, the engine will shutdown within seconds. Standard applications include automatic over-speed electronics and CAC pipes included for some vehicles. The butterfly valve design reduces the number of parts and the overall size as compared to competitive units. Aluminum and stainless components plus weatherproof electrical connectors are used to prevent corrosion. Easy installation with no welding needed for hose retaining beads by utilizing innovative bead boot locks.